The Abū Qīr Bay (sometimes transliterated Abukir Bay or Aboukir Bay) (Arabic: خليج أبو قير‎; transliterated: Khalīj Abū Qīr) is a spacious bay on the Mediterranean Sea near Alexandria in Egypt, lying between the Rosetta mouth of the Nile and the town of Abu Qir. The ancient cities of Canopus, Heracleion and Menouthis lie submerged beneath the waters of the bay. In 1798 it was the site of the Battle of the Nile, a naval battle fought between the British Royal Navy and the Navy of the French First Republic. The bay contains a natural gas field, discovered in the 1970s. Abu Qir is Arabic for "Father Cyrus", a martyr of the Coptic Church. Eutrophication: causes, consequences and control. Abu Qir Bay lies approximately 20 kilometres east of Alexandria, bounded to the southwest by the Abu Qir headland, on which the town of Abu Qir is situated, and to the northeast by the Rosetta mouth of the Nile. The bay is a highly fertile Egyptian coastal region but suffers from acute eutrophication and pollution from untreated industrial and domestic waste. The ABU QIR Fertilizers and Chemicals Industries Company, a large producer of nitrogen fertilizer, is located on the bay. In ancient times Abu Qir Bay was surrounded by marshland and contained several islands. As early as the 7th century BC, port cities were established on the bay. The bay now contains the underwater archaeological sites of three cities from the pre-Hellenistic, Hellenistic and Roman periods. The Eastern part of ancient city of Canopus is submerged in the bay, along with the remains of Menouthis and its sister-city Herakleion–Thonis which now lies 7 kilometres offshore. They were excavated by French underwater archaeologist Franck Goddio. A number of sunken ships have been excavated from the bay, including a ceremonial boat (Neshmet boat) dedicated to Osiris and several Roman era ships. 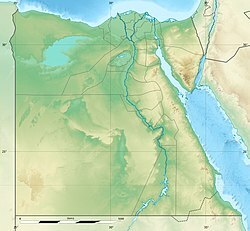 Classical sources indicate that the Canopic branch of the Nile delta once entered the sea in the vicinity of Heracleion or Eastern Canopus. A combination of Islamic texts and investigation using geoarchaeology suggest that this branch was still in existence in the eighth century, when a major inundation caused Eastern Canopus to sink into the bay. The Canopic branch subsequently declined and eventually became closed. On 1 March 1801, some 70 British warships, together with transports carrying 16,000 troops, anchored in Aboukir Bay near Alexandria. The intent was to defeat the French expeditionary force that had remained in Egypt after Napoleon's return to France. Bad weather delayed disembarkation by a week but, on 8 March, Captain Alexander Cochrane of HMS Ajax deployed 320 boats, in double line abreast, to bring the troops ashore. French shore batteries opposed the landing, but the British were able to drive them back and, by the next day, all of Sir Ralph Abercromby's British army was ashore. The British then defeated the French army at the Battle of Alexandria. The Siege of Alexandria followed, with the city falling on 2 September 1801. L’Orient, Napoleon's flagship, was destroyed by Nelson's fleet and lies in the bay on the sea bottom. It was carrying five million francs in gold and one million in silver plate taken from the Knights Hospitaller in Malta. Between 1998 and 1999, French archaeologist Franck Goddio led an expedition that carried out an underwater archaeological study of the wreck-site. Nelson's Island, also known as Aboukir Island, is a 350 m (1,150 ft)-long island in Abu Qir bay that is used for picnics and recreation. The island has been reduced considerably in size since antiquity as a result of erosion and sandstone quarrying. When it was a part of Ancient Egypt it was probably connected to the mainland at what is now the Aboukir naval base. In Pharaonic times the island lay on a primary commercial route to the Nile River and became a major religious and commercial centre. There is archaeological evidence that a high-status necropolis was sited on the island. 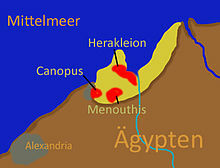 During the Ptolemaic Kingdom the island was fortified. Following the Battle of the Nile in 1798, a number of British dead were buried on the island. Their graves were discovered in 2000. As they were in danger of sea erosion, thirty bodies were reburied at Chatby Commonwealth War Graves Cemetery in Alexandria in 2005. ^ a b Ansari, Abid A.; Singh, Gill Sarvajeet; Lanza, Guy R.; Rast, Walter (2010). Eutrophication: causes, consequences and control. Volume 1. Springer Science & Business Media. p. 174. ISBN 9789048196258. ^ Mirsky, Steve (31 January 2010). "Cleopatra's Alexandria Treasures". Scientific American. Retrieved 23 July 2015. ^ Rothstein, Edward (3 June 2010). "Cleopatra's Underwater Kingdom". The New York Times. Retrieved 23 July 2015. ^ Shwartz, Mark (11 December 2000). "Scientists, archaeologists and historians will unravel the mystery of Egypt's sunken cities" (Press release). California: Stanford University. Retrieved 23 July 2015. ^ "Lost underwater city explored in documentary". Νεος Κοσμος. 3 May 2013. Retrieved 23 July 2015. ^ "Archeologists discover three Roman-era shipwrecks in Egypt's north coast". Daily Sabah. Istanbul. AP. 23 November 2017. Archived from the original on 24 November 2017. ^ Khalil, Emad; Mustafa, Mohamed (2002). "Chapter 31: Underwater archaeology in Egypt". In Ruppé, Carol V.; Barstad, Janet F. (eds.). International Handbook of Underwater Archaeology. New York: Kluwer Academic. pp. 519–534. ISBN 978-0-306-46345-7. ^ Cooper, John (2014). The Medieval Nile: Route, Navigation, and Landscape in Islamic Egypt. The American University in Cairo Press. pp. 30, 58–59, 74. ISBN 9789774166143. ^ "Napoleon Bonaparte's fleet". Franck Goddio. Retrieved 12 October 2017. ^ Philippe Bohstrom (26 July 2016). "Graves Found Shows Women Fought With British in the 1798 Battle of the Nile". Haaretz. ^ "Reburial for Nelson's comrades". BBC News. 18 April 2005.